This is my half cheated chicken pot pie! >>> Story begins... I actually used Leelee's recipe for the crust but my 'Kong Fu' (skill) too lousy, couldn't handle the dough well... found it too soft and couldn't hold at the side of the tin/pan. End up... I used ready made unbaked pie shell for the bottom part and half of the dough for the top. Thanks Leelee Shifu! Hmmmmmm... The top crust was good, we both like it! That's another recipe which I'm interested and have listed under my next to do list. ;) It is Linnish's Chicken Pot Pie. For Lin... it's called CHICKEN POT PIE!!! Thanks Lin for the enlightenment. For the Crust: Put all the ingredients into the mixing bowl except yoghurt, and mix to a crumble. Add in yoghurt and mix to a dough. Dough will be very soft so need to keep it refrigerated for at least 30 mins. For the Fillling: Boil potatoes and carrots until semi cooked; Add in frozen green peas, and continue to boil for another 10 mins; Drain and set aside. Heat about 2 tbsp of oil in wok and fry diced onion until transparent; Add chicken meat and mushrooms, fry for a while to break up chicken; Add in boiled vegetable in Step 2, first 1/2 cup chicken stock, heavy cream and white wine; Stir-fry for a few mintues. Add in the remaining chicken stock with corn starch mixture; Stir until the sauce has thicken. Set aside for later use. The steps for the chicken pie will be as per normal. You can either do big pie or mini pie. Just need to roll out the dough, cut the size required and place in a pie dish. Poke hole on the base using a fork and place ingredients on top. Cut another piece of dough to cover the top. Poke a few more times using fork on the cover of the pie and brush with 1 beaten egg. Baked in a preheated oven at 180 °C for 30 mins. 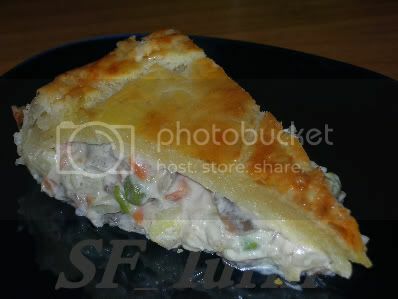 Fonia, your Chicken Pie looks so delicious, especially the filling inside. Yah, I agree your chicken pie looks so delicious. *Drooling* what size of pan you using? Oh please, Fonia is a skinny girl,it's okie for you to eat chicken pie. Another way to 'play cheat' is, you can use ready made puff pastry as the bottom, side and cover. Don't bother about making your own puff pastry, you'll cry. hahahha.. Thanks, Jas! U like creamy filling!? If yes, this might be the one. :) Oops... I used a 24cm pan. Mike, no lah! I'm still a beginner and have a very very long way to learn from all of you. 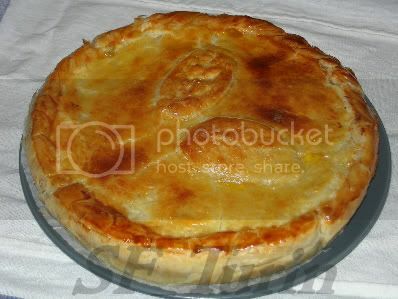 Wow...Your Chicken Pie Sure Looks Delicious..."Drool'ing"..hehe..
Hope Have chance to tried your Many many Good Food!! !